EasyNetMonitor is a small network information tool which resides in the system tray. The application is portable and thus requires no permanent installation. Once the program is run, its icon will appear in the system tray. From there you can add different IP addresses to monitor and gather information about. Version 2.8.0.2 is a freeware program which does not have restrictions and it's free so it doesn't cost anything. 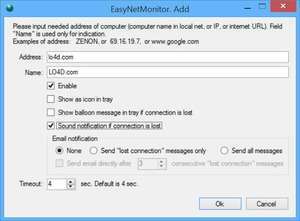 For security reasons, you should also check out the EasyNetMonitor download at LO4D.com which includes virus and malware tests. Additional screenshots of this application download may be available, too.